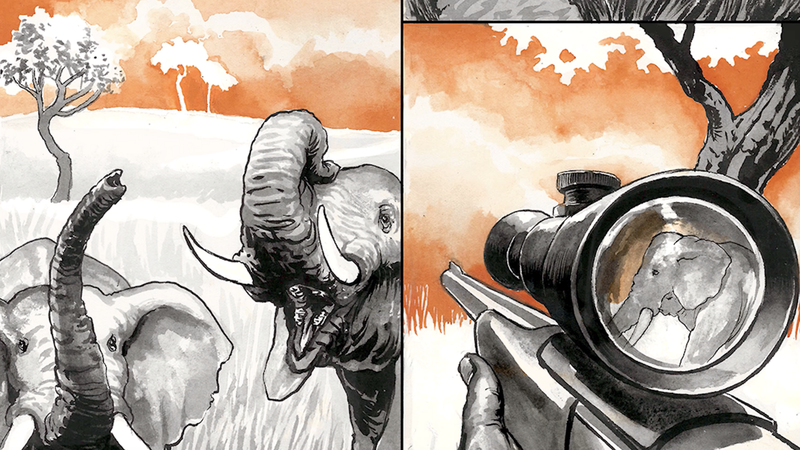 Here’s why the team behind it thinks a graphic novel is the right medium for highlighting the elephant poaching crisis. Javier Barrios, a screenwriter and manager of the television and film script library at the Writers Guild of America, has twin daughters with twin obsessions: pandas and elephants. In the process of learning everything he could about these animals alongside his children, he came across a harrowing 60 Minutes documentary about the crisis of African elephant poaching and the Sheldrick Wildlife Trust, Africa’s first orphanage dedicated to rescuing and raising abandoned elephants. Barrios, whose films often have an environmental bent — one of his first scripts was about the collapse of the cod fishing industry on Canada’s East Coast — knew he wanted to tell this story. He began writing a treatment for a feature film about a herd of elephants forced to flee their homeland to the sanctuary of an elephant orphanage hundreds of miles away. Unbeknownst to Barrios, his friend and collaborator Marc Gaffen, a writer and crew member on TV shows like The Bernie Mac Show, Grimm, and New Amsterdam, had seen the 60 Minutes documentary as well. Gaffen knew his friend would be interested in it, so he brought it up the next time they were together. Barrios showed him the treatment he’d written — and Gaffen knew instantly he wanted to be a part of it. And the Tuskers graphic novel project was born. It’s live on Kickstarter now, where the team is raising funds to complete the artwork and print and ship it out to backers. Tuskers follows a herd of 14 African elephants who must flee their home in South Sudan for the safety of an animal sanctuary in Kenya as a vicious poaching militia chases them; they are guided on their journey by a group of wildlife conservationists. 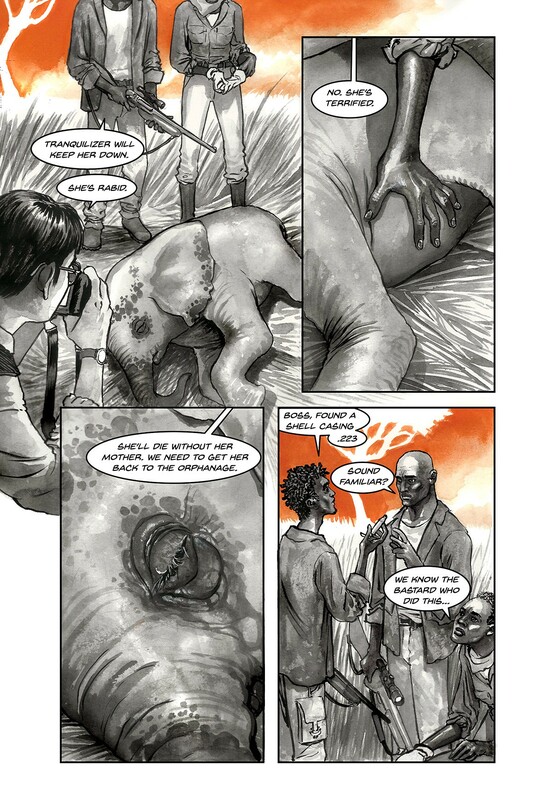 The story unfolds from the perspectives of several central characters, both human and elephant. Among the humans are Dr. Zuri Erivo, the caretaker of an elephant orphanage in South Sudan who leads the herd on their trek; Sgt. Elias Delgado, a former U.S. Army Ranger grappling with the trauma of his battlefield experiences in Afghanistan; and Joseph and Rafi, the leaders of the EcoGuards, a group of conservationists who routinely risk their lives to protect and lead elephants to safety. Abdalla Karumba, a vicious warlord who slaughters elephants for their ivory to pay for weapons and accumulate power, heads the private militia they’re fleeing. 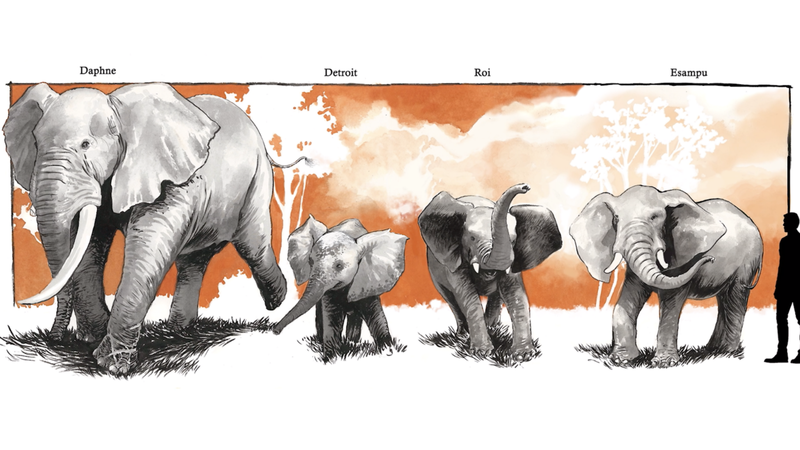 Four elephants lend their perspectives to the story: Detroit, a baby elephant who has witnessed the brutal killing of her family; Esampu, a take-charge youngster whom the writers describe as the “big sister” to the herd; Roi, a lively prankster who’s adept at stealing food; and Daphne, the matriarch, who grew up in Dr. Zuri Erivo’s orphanage after being gravely wounded by a leg snare. 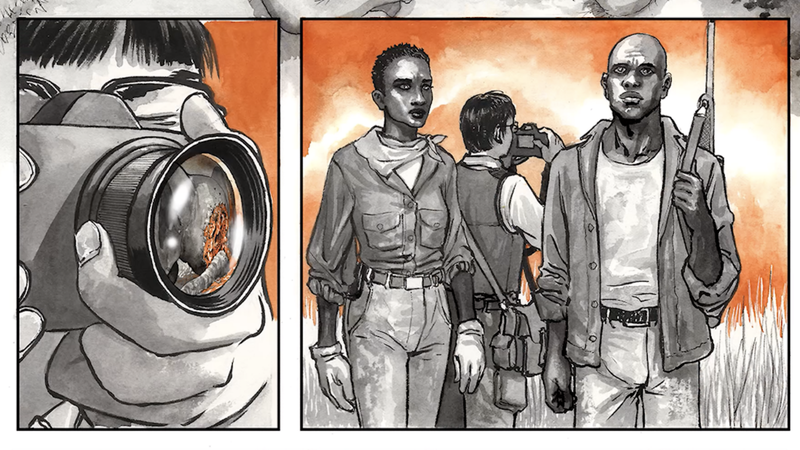 Barrios and Gaffen’s aim with the graphic novel is twofold: first, to tell a compelling story, naturally. “It’s one thing to have a message, but you have to entertain as well,” Barrios says. But second, and just as important, the writers aim to draw attention to the brutality of elephant poaching and the ivory trade, and the grave threat it poses to African elephants. At the beginning of the 20th century, they note, the African elephant population was estimated to be around 12 million. By the beginning of the 21st century it was estimated to be around 350,000 — a 97 percent decline. 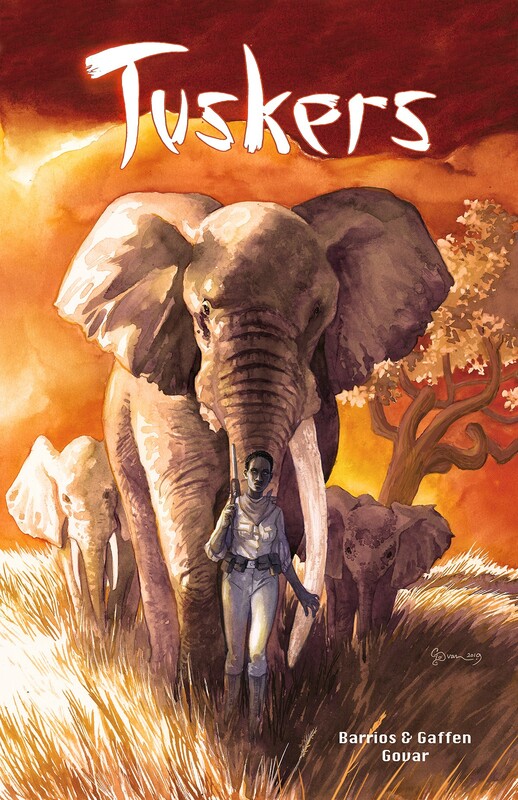 Although the graphic-novel format tends to be associated, in the popular imagination, with the flash and hyperbole of superhero comics, Tuskers takes a more nuanced, realistic approach — even to the villains of the story. “We have this whole section about who the poachers are and how they came to be poachers. Yes, they’re doing awful things, and they’re the villains and antagonists in the story. But there is a social, economical reason why they’re doing what they’re doing,” Gaffen says. Many of the characters in Tuskers, as a result, are based on real people and situations. Dr. Erivo, for example, is inspired by Dame Daphne Sheldrick, founder of the Sheldrick Wildlife Trust. To map out the personalities of the elephants, they drew on traits they observed in videos from Sheldrick and other elephant orphanages in Africa. Death looms large in Tuskers. 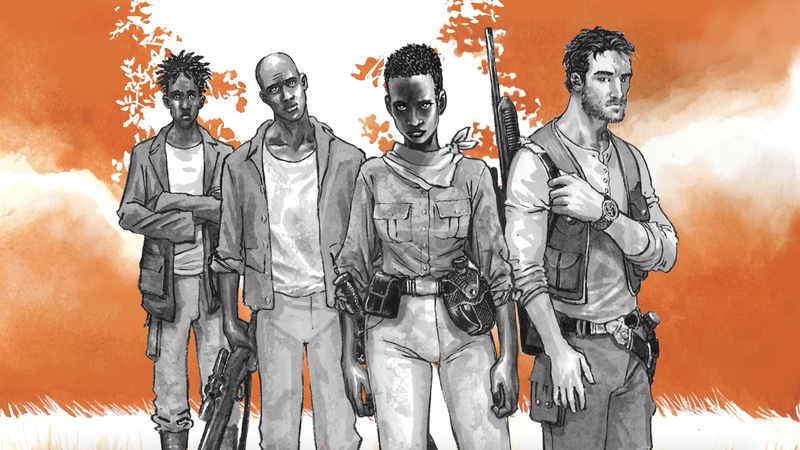 The first pages open with a scene of graphic violence, as Detroit’s family is murdered and their faces hacked by poachers to harvest their tusks. The artwork is done in black-and-white, with splashes of orange for emphasis; in these scenes, the blood, too, is orange. And such will be the fate of the herd if they don’t make it to the orphanage. Tuskers is live on Kickstarter until April 11, 2019.